Before there were flowers or even bees and butterflies to pollinate them, ferns ruled the planet. A primordial plant that carpets the Earth to this day, ferns represent tenacity and abundance while filling a room with a lush sense of vivacity. Through twists and turns of evolutionary adaptations, ferns have feathered the world’s biomes for more than a 100 million years and have diverged into more than 12,000 different species that inhabit 6 out of the 7 continents. 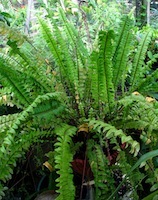 Unlike lovely bouquets of flowers that bloom brightly and then fade, a potted fern shows a sense of longevity and stoicism without seaming stodgy. Show a new client that you and your company have staying power with the symbolic gift of one of these choice ferns. A southern comfort on porches next to rocking chairs or in a north-facing office window in a heirloom urn, the Boston Fern is the classy older uncle of houseplants. The uniformly pale green fronds of this hearty plant cascade out and over, reaching lengths of 1 to 3 feet in a showy circular arrangements. Easy to grow, the Boston fern is a great houseplant, needing regular watering and medium light. As a gift, this plant represents confidence and will instill a sense of both security and expectation in a new client’s office or home. Much like the bow tie, this fern is both elegant and manly, and absolutely timeless. Few things in life shimmer and drip with ephemeral awe quite like the maidenhair fern. Slender black stalks unfurl bright green showers of leaflets on fronds that seem to be floating in air. This is the perfect fern for creative jobs and creative types to get, give or gawk at and do much to set the mood at an artsy occasion. The natural loveliness of this dainty fern make it a perfect plant for gifting new clients with your creative contributions. A good florist or garden and nursery center will have this strange and unusual fern mounted on a flat piece of wood to hang on the wall of an office or home. One flat vegetative leaf lies flat mounted on a surface while larger, antler-shaped fronds trail downward over time. Odd? Perhaps. You were hired because you stand out from the rest, so why get a new client the same old flowers. Show them you are an innovator with this anything but cookie-cutter plant.